Very interesting and thought provoking. Strange how deliberate ‘backfilling’ continued to appear as a Neolithic phenomenon thousands of years later in causewayed camps of the British Isles. I like the title! The head was clearly the most revered (if that’s the right assumption) part of the body. The rest was presumably left, literally, for the birds. Yes, and it`s not only the backfilling. 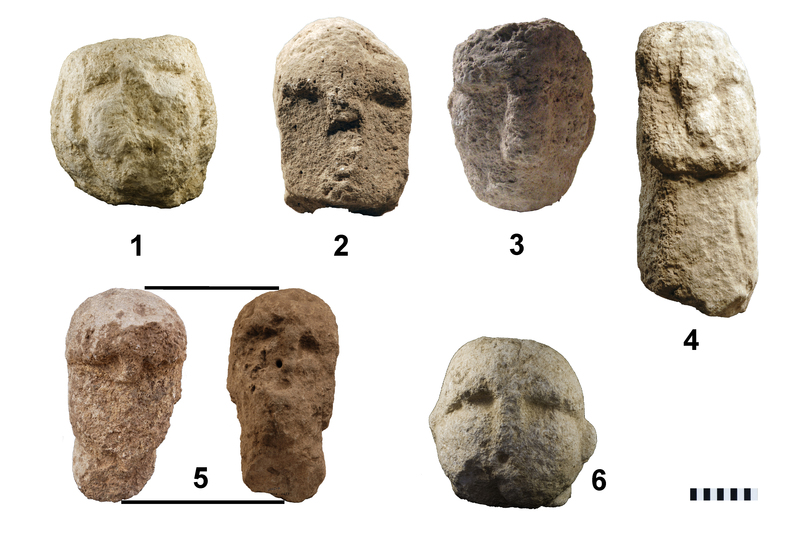 Breaking off the heads of figurines is another social practise that you can follow throughout the Neolithic and Europe. Of course these practises will likely have taken on different meanings in different cultural contexts – but they could be part of the original ‘Neolithic Package’. So the megalithic tradition seen in western Europe from 4/5000 bc could well have descended from the much earlier Anatolian tradition, with modifications caused by cultural ‘drift’ and change through time? But how is the appearance of the jaw dropping skill and scale of Gubekli Tepe to be explained, particularly within such a relatively brief period since the Lower Dryas? Thanks for your interesting comments, here are just a few quick thoughts from me. I wouldn´t say that the megalithic tradition of western Europe is directly interrelated with the Göbekli Tepe type monuments. Neolithic megaliths are absent from central Anatolia and southeastern Europe, so they were not part of the package distributed on that way to Europe. The examples of megalithic buildings from the Mediterranean – the temples of Malta, or the Taulas of Menorca – are much younger and very different. So neither that way works. The “why then and there”-question is one of the most discussed issues in the field of Neolithic Near Eastern archaeology right now. In his book “The birth of the gods and the origins of agriculture” Cauvin has given an interesting answer. He argued that the transition to the Neolithic was influenced or started by a change in thinking, by the use of symbols that preceded agriculture. 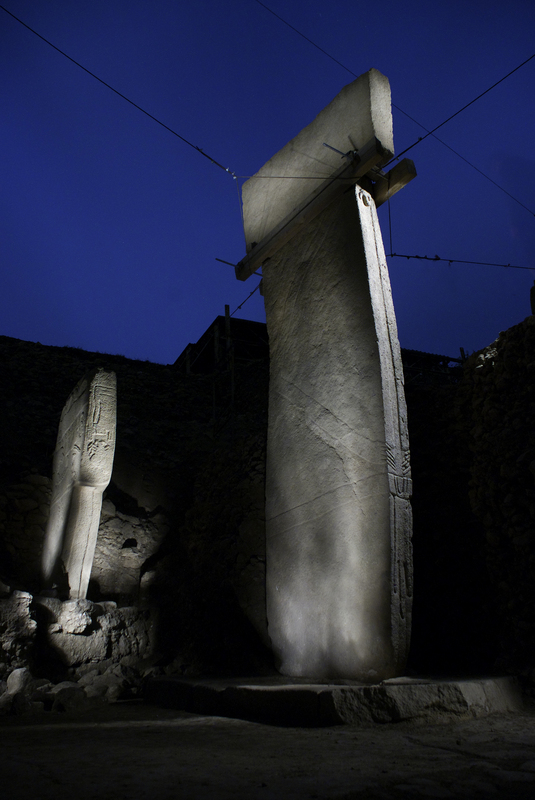 Göbekli Tepe is evidence that he was right in that (and of course there is also the Natufian with its rich symbolism before GT). However, symbols and art have been around much longer (Palaeolithic cave art, figurines), so most likely several factors are involved here. I think that the climatic optimum following the younger Dryas was surely one of these factors. An environment that was suddenly rich in resources made the constant struggle for survival less central and allowed for human creativity to unfold. Thanks,Oliver. I had no doubt there had been a change, possibly even a revolution in late pleistocene thinking and symbolism. I have not read any Cauvin and will search for examples from my local bookshop; I must say I’m inclined to a more materialist,’down to earth’ perspective supporting the view that economic change alters social thinking. Not really Marxist but the argument that the Natufians ‘invented’ agriculture for survival reasons during the increasingly arid Younger Dryas environment does hold more water for me than saying their descendents would voluntarily opt for gritty cereal gruel rather than a juicy antelope steak even though herds must have increased once warmer climatic conditions returned. I’m still left with wondering where the quantum leap in the skills needed to construct GT came from! Yesterday, on a page about the pillar 43 and fox paper, I was asking you about the diameter of the hole on the pillar depicted here. One of the workers is leaning upon it, and there is a some book, presumably of A4 format there. I think that the hole is 7-12 cm wide, but I am guessing here.. This particular stone was I think a sighting stone for observing a passage of (some heavenly objects). What can you tell us about it ? How was it initially aligned ? Where it stood ? What is the exact diameter of that little hole (if I am not asking too much) ? The alternative explanation, aside from astronomical ones, is that the hole was used for spying on passage of herds, for the purpose of hunting. Dual use is of course possible too. 1. At current state of research it cannot be said if the opening really is going all the way through the stone, it could as well be just a cavity similar to other examples known from the site. 2. With a view to the rest of the excavated parts of Enclosure D it seems likely that the enclosure wall is running right behind that stone, thus blocking any possible line of sight (*if* the opening really was complete). 3. Again we have to consider the possibility to deal with subterranean structures here. In this case, it would’ve been impossible to see anything (in particular anything in the sky) through this opening (if it was one). I would just add to Jens’ comments that we don’t know whether this stone is in it’s original position. Many pillars, sculpted pieces and stones were reused and placed in secondary positions at GT. And in most of these cases, there is just no way of knowing where the workpieces originally might have been placed. The stone is bored completely through. If the picture is zoomed, one can see through to the other side. It has a height of a man, so it is suitable for viewing through, either for spying on herds in distance, or for observing star transits at night, or both. Diameter can be roughly judged by comparing with the A4 notebook on top of it, and with human heads nearby. A star transit across the hole would last about 15 minutes if observed from about one step distance, more if one moves closer. The stone is at that picture between central pillars, so I presumed that it was found there, which is exactly where it should have been. Whenever you find sighting stones like that one, please note exactly the direction to which they point, and their position. Same goes for central T-pillars. Otherwise you loose some possibly very important information just because you don’t care about astronomy. Well sir, I wonder if you have ever observed how magnificent a pristine night sky looks in true pitch darkness without modern pollution by light and smog ?.Those people were viewing it every day, and had no electricity to distract them. Surely they were stargazers. Anyway, I have a valid hypothesis about what they were observing, when, and why and was hoping that you record this kind of data (the azimuths of big stones), but apparently you don’t. I regret that this is so. Please do in the future. Nonetheless, if you have pictures of that stone in original position, perhaps the necessary positional details can be discerned from those old pictures. As for the diameter, this anyone who can access that particular can measure in seconds at least with a ruler, if not micrometer, so there is really no excuse of that not being done, other than perhaps a revulsion against any idea that the site might have had some astronomy related purposes. this you might not know, but it can be checked if you supply the positional data of the pillars to those of us who are able to analyze them properly. I think that it would be rather miraculous if they did not use the top-of-the-hill position for some splendid sightings. Seems we were talking about different stones then, you’re referring to Pillar 30 here but I assume Collins means the stone in the northern perimeter of Enclosure D. Almost all photos here and published elsewhere do show the original position (the ‘in situ’ find position that is) as we usually do not change of move the megalithic stones (with rare exception if working security makes this necessary, but in this case it always will be indicated). Ok, so you mean Pillar 30. This is one of the T-shaped pillars in the ring wall of Enclosure D. It does not stand between the central pillars, but to the northeast of Pillar 18 (=eastern central pillar). Although the pillar shaft is broken, there is no indication so far that it was moved in prehistory. Nor did we move it. And, by the way, contextual information is the basis of every interpretation in archaeology. We record the position, measurements, characteristics etc. of every find. That´s probably why the internet is full of astronomic interpretations of GT – because you can get that data from our plans and documentation. Whether those interpretations are well-founded is another question of course. All you can see through that hole at the moment are adjacent pillars and wallstones. If the enclosures were roofed, that would also be very much what you saw in the Neolithic. The pillars at GT have holes in different sizes, in many cases they take the form of loops. A simple interpretation for theses holes is that the pillars were adorned during ceremonies. I was referring to the top-most image on this page. If that is a T-pillar 30, I can’t tell from the perspective on the photo. Fair enough, I could add that the holes in pillars might have been used for attaching ropes to lift them by some suitable contraption, perhaps in ceremonies, but maybe also during transport from the quarry. Detailed close-up examination of the erosion marks, shape and dimensions of that and other holes might be able to resolve for what were they used for. On the image above the hole appears very circular and having a properly rounded edge. Regarding the roofing, it is quite possible that the structure had a roof. If it was used for 18 centuries, and stood in open, then there should have been traces of erosion by rain. Such traces are not visible on central T-pillars, I think, at least not in the enclosure D. Some others, more recent pillar appear eroded, though. Even in such case (and perhaps especially in such case, sighting holes in the wall would be required. We call them windows today. Useful things they are. Regarding Andrew Collins, and the rib bone plaque, there appears to be an indication of a sighting hole between the pillars. A small fist sized window would suffice for the stated purpose. Are you telling me that there was no such thing discovered thus far, and that the envisioning images of a sighting stone (or window in the enclosure wall) by Andrew are not supported by excavated facts ? I think you are right – windows are useful things. Less so in subterranean structures. Like the ones at GT most likely were. That may be the reason why there are no windows in the enclosure walls. And yes, I am telling you that Andrew Collins’ ‘reconstructions’ are not based on excavated facts. As of yet, it is hard to actually say how long these enclosures were really in use or even open before they have been backfilled. I don’t know where your information on the ‘erosion’ of certain pillars come from, but usually it is those pillars very close to the surface which show some damage – either by physical force (due to recent farming activity) or, more often, by congelifraction. And yes, we are trying to tell you that there was no such thing as a ‘sighting stone’ discovered as of yet. At current state of research there simply are no windows in these enclosure walls. The workpiece in question here, north of both central pillars of Enclosure D has a cavity, but we cannot determine if this opening really is a ‘hole’ through the stone – that cavity is still filled with sediment at this point and, as I pointed out above, (judging by neighbouring features unearthed in deep soundings), behind this piece we have to expect at least one of the enclosure walls (followed by mighty layers of more sediment), effectively blocking any attempt to take a bearing. What makes you think that the pillars were located underground ? This is not a cave, but a pile of rubble all around them, as far as I can tell. This is not “a p. 30”, it’s Pillar 30 in the ringwall of Enclosure D. No sighting stone, a T-shaped pillar of about 4 m height. Jens referred to the stone that Collins believes to be a sighting stone. That is another stone, not Pillar 30. That the Enclosures are subterranean is the result of stratigraphic and building research on site. The enclosures were set into a pre-existing mound. Thank you for your answers. Despite some misunderstandings in the process, you have been helpful. I have one last question: I’ve seen maps of the whole area, but none of them has a scale on a side, so I do not know how large is the site. What is the approximate air distance from enclosures D and F, for instance, and are they on the same elevation ? Thanks again. Our published plans usually come with scale (or at least note on scale), cf. here or here ([external link], Fig. 3 – also with eleveation contour lines). Also, as Oliver pointed out, we were apparently talking about two different work pieces – I was relating to a stone with a cavity in the northern perimeter of Enclosure D often referred to as ‘sighting stone’ in internet discussions (a term we never introduced or used), you seem to mean Pillar 30. The remark about ‘subterranean structures’ does not refer to the filling inside the enclosures, but more to the thick layers of sediment *outsdide* these. 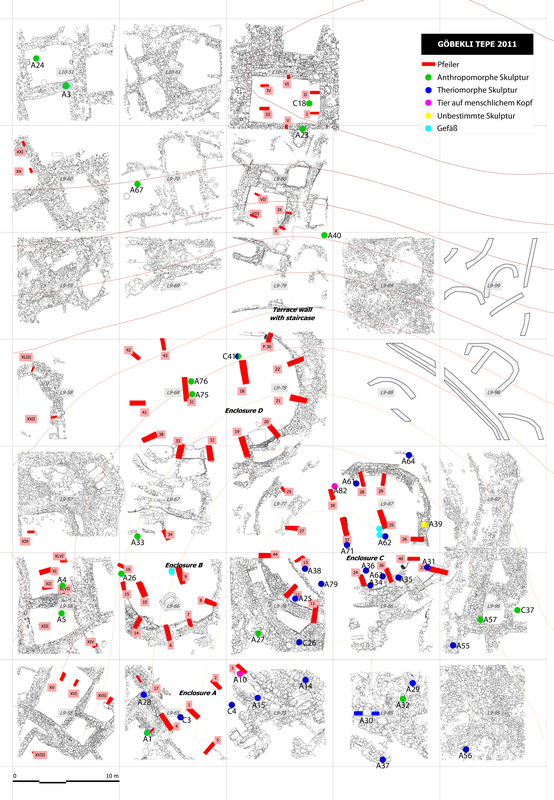 Still ongoing stratigraphic studies and building research (regarding the enclosing walls in particular) offer a great insight into these line of thoughst and do indeed suggest the possibility that (at least some of) the enclosures were set into an already existing mound – as Oliver mentioned. Jens, I was unaware of any discoveries that could described as architecturally seminal. Could you forward details? I’ll look up your article too Oliver. Re the brewing of alcohol, I know that carved stone ‘vats’ with traces of fermentation have been found at GT and when reading this and knowing the culture was pre-agricultural in Schmidt’s assessment, was hit by the beautiful thought that the neolithic revolution had in fact originated in the quest for plentiful supplies of beer. For purely medicinal/spiritual reasons, of course..
Well, I was referring to *possible* forerunners of organic material which are not preserved. The technique applied with the limestone pillars and sculptures may well have originated on woodwork for instance. The article Oliver linked to is a great start to get a general understanding of the era and the long-term perspective we have to consider when viewing into this so-called revolution. 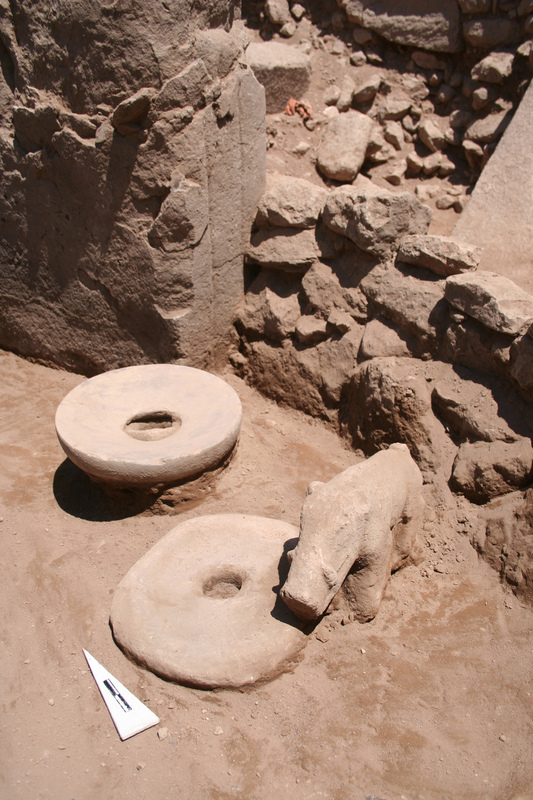 Regarding possible forerunners, we have for example the Natufian semi-round or round building from Ain Mallaha/Einan inside a settlement that also has produced ‘symbolic’ objects. Another case of early ‘communal buildings’ is Hallan Cemi in southeastern Turkey. The concept of communal/special buildings with close connections to belief systems/symbolism (in Hallan Cemi aurochs seems to have been of special importance) seems indeed to start earlier than GT. 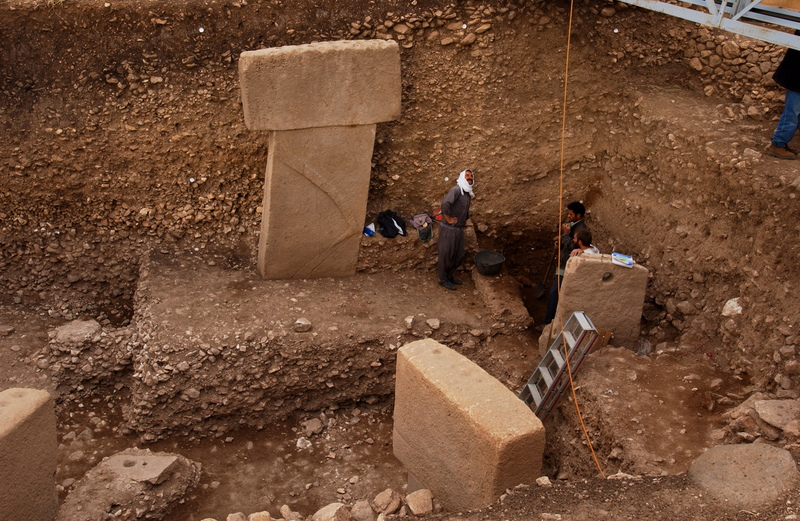 What is special about Göbekli is (a) the monumentality and the richness of depictions, and (b) that the site seems to contain only special buildings. In another post I have shortly described that the T-shaped pillars are a specific of the Urfa region. To the east we have standing stones without T-heads, to the west special buildings with wooden supports. Yet the whole region shares the same symbolic objects. So, to some degree, the appearance of monumental stone buildings and T-shaped pillars seems to be a special cultural trait of the region between the upper Balikh and Chabur rivers. Well, we’ll never know how well developed Natufian woodworking skills were, I suppose. Stonehenge in England clearly shows how such skills were carried over into megalith construction but the mortice and tenon joints used were what would be seen in the construction of homes, not fine carving. Are the standing stones farther east that you mentioned, Oliver, a potential forerunner of the GT pillars? Are they carved at all? I would rate Natufian carving skills quite high judging from bone objects like the el-Kebara sickle haft. Whether this implies monumental wood carvings is another issue, of course. Thanks Oliver. I read your post referring to T-shaped pillars at Sefer Tepe, Karahan Tepe and Hamzan Tepe with interest and see they’ve not yet been excavated. Still early days in researching this part of Anatolia then.. Very interesting also to read that the wild, undomesticated grains were not really suitable for bread making and better for beer (and gruel),suggesting the fermentation of alcohol for periodic feasting may well have been the main driving force behind the adoption of agriculture. Grain as a serious alternative to meat (except in very hard times) would presumably had to await domesticated grains of larger size? I just listened to your podcast interview on Archaeology Podcast Network. Especially after listening to the Joe Rogan interview of Hancock vs Michael Shermer, it was nice to have a reasonable voice about the site and I appreciate all the firsthand information you brought to the show. I look forward to reading this blog more in the future now that I know about it, and even more to visiting Gobklitepe in the near future! Also, I heard you mention that the site is not open to tourists at all times. What are the times of year I would be able to visit? Thanks a lot, Ben. Yes, the site is currently closed due to shelter construction, but re-opening was just announced for mid-July. We don’t really have much to do with tourism development there though, everything regarding these issues are managed by the Ministry of Culture and Tourism. However, in the past the site used to be open to visitors during the day hours. Thanks for the reply. I want keep an eye on the accessible times after my unfortunate experience on Santorini when the Akrotiri site I had come to see was closed, curiously also to put a roof over the site. You’re welcome. Yes, preservation really has become top priority for archaeological sites under excavation, too. Which is a good thing in my opinion. For me, the “idoletto di arnesano” looks like GT artefacts. 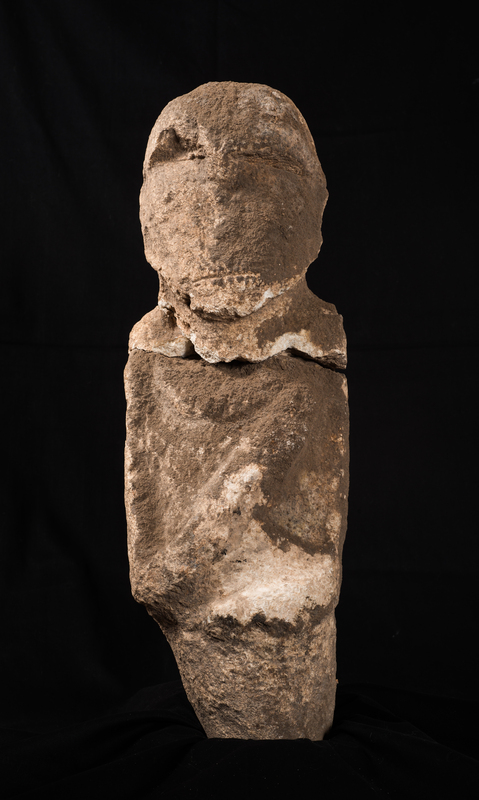 Is it possible that east anatolian people going to Creta 7000 y BCE, and after to Italy, made this idol ? The Arnesano figurine is Final Neolithic, 3rd millennium BC. This would be a very long time for PPN traits to survive. I think the similar way to depict human facial features has rather something to do with the technique of carving these faces from soft stone. There are very similar heads from wooden sculptures from completely different cultural and chronological contexts.